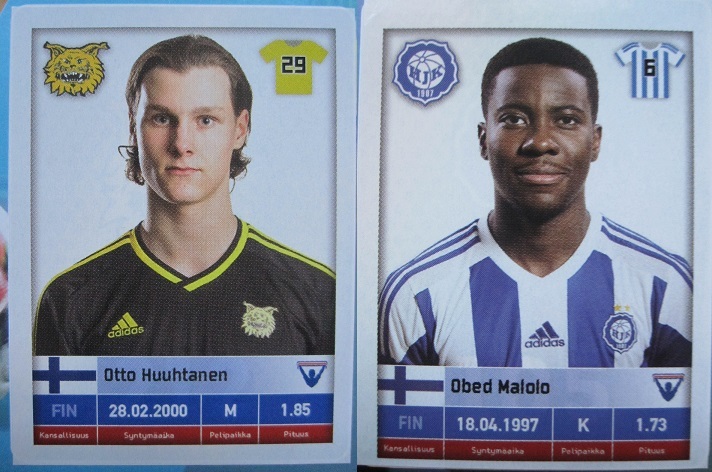 The greatest surprise of 2016 for football stickers is the first collection of the Finnish League. Published by the Greek company Carouzel, the album covers all the Finnish Premier League (Veikkausliiga) with an extensive collection including stickers of players, club badges, team photos, stadiums, and coaches of the 12 teams competing in the league. The album opens with a preface, the summary of the championship 2015 (won by SJK), and three introductory stickers: the cover of the album, the Veikkausliiga logo, and the logo of Carouzel. The first part of the album introduces all the teams with three stickers each: the club badge, and the team photo (two stickers). Teams are shown following the order of the classification of the season 2015, starting from the winner SJK Seinajoki. Each team is presented in details with player stickers on four pages per team. The number of stickers per team is variable. The most remarkable players have two stickers (profile and in action). The last part of the album is a section with stadiums and coaches of all the clubs, for a total of 24 stickers. This album is filled with young players, here below the list of all players under 20. Are you looking for some stickers? Would you like to exchange albums or just ideas about sticker collections?